The fish-out-of-water trope is a familiar one in literature, drama and sitcoms. 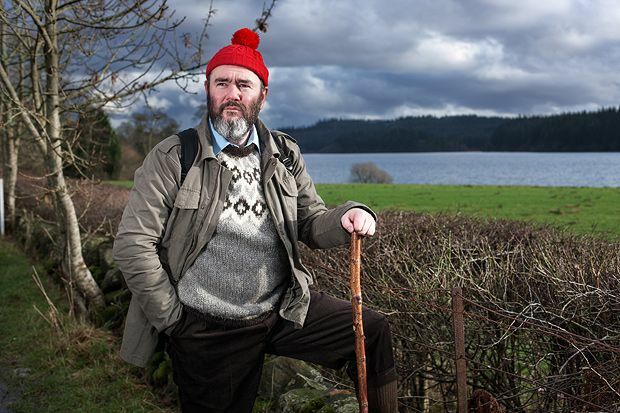 As Falkirk indie king Aidan Moffat travels around Scotland during the making of Where You’re Meant to Be, he appears to be swimming against a tide of everything from casual indifference to outright hostility. His crime? Taking old Scottish folk songs and injecting them with a contemporary (and often frank) sensibility. But, as Paul Fegan’s beautiful documentary is keen to note, the ex-Arab Strap man has never been one to care too many hoots about what people think of him. So we see Moffat farting on hillsides, swearing at travel plans going awry, simulating sexual pleasure upon a toy Nessie, and being heckled by non-fans. But as his contemplative voiceover proves, Moffat is one narrator that we should happily rely on. His wholly democratic approach results in him being perfectly comfortable in allowing his critics a vocal and visible platform: Moffat’s chief antagonist is Sheila Stewart, the late traditional-music pioneer who, in her heyday, performed for a president and a pope. By contrast, it almost feels like Moffat’s fanbase is invisible until the climactic Barrowlands gig – an inherently tense scene, as the stage is set for one last cameo from his new pal / quasi-nemesis. Stewart’s death in the wake of filming gives Fegan’s documentary an added poignancy, as well as a sense of closure. In his narration, Moffat considers whether she cared about how people would remember her. A clash of cultures may be at the heart of Where You’re Meant to Be, but both the old and the new will always be concerned about their legacy (there are evocative clips of a younger, balladeering Stewart, as well as late-90s Arab Strap upsetting the dignitaries of Falkirk). In that respect, this funny, moving and occasionally cringeworthy viewing experience serves both Stewart and Moffat wonderfully well. Screening on Fri 19 and Wed 24 Feb as part of the Glasgow Film Festival 2016. General release TBC.